Yesterday's post reminded me to remind you about this book I posted about back in 2011. The Morris Museum in Morristown, NJ is home to the Guinness Collection of 750 antique, mechanical musical instruments and automata. It is one of the biggest, best, and most well-managed collections I know of. 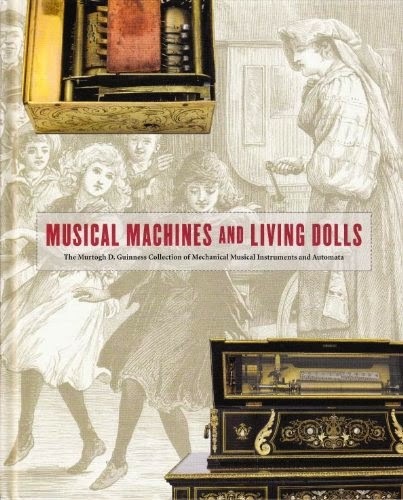 The museum has created an illustrated book featuring pieces from its permanent exhibition titled Musical Machines and Living Dolls: The Murtogh D. Guinness Collection of Mechanical Musical Instruments and Automata. Written by Ellen M. Snyder-Grenier (former Curator of the Guinness Collection), this 144-page hardcover features 138 photographs and over 20 illustrations on beautiful glossy paper. Evenly divided between automata and mechanical musical instruments, the book is a wealth of information on the history of both. It is a beautiful and well-written book, which offers a rich view of an extremely important collection. I recommend it. It makes a great gift for those with a serious interest in the subject. Here is where you can order Musical Machines and Living Dolls.